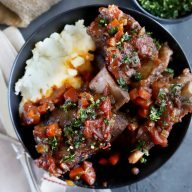 Quick Cherry Tomato Confit is a savory, delightfully creative dish that can be used in oh-so many ways. 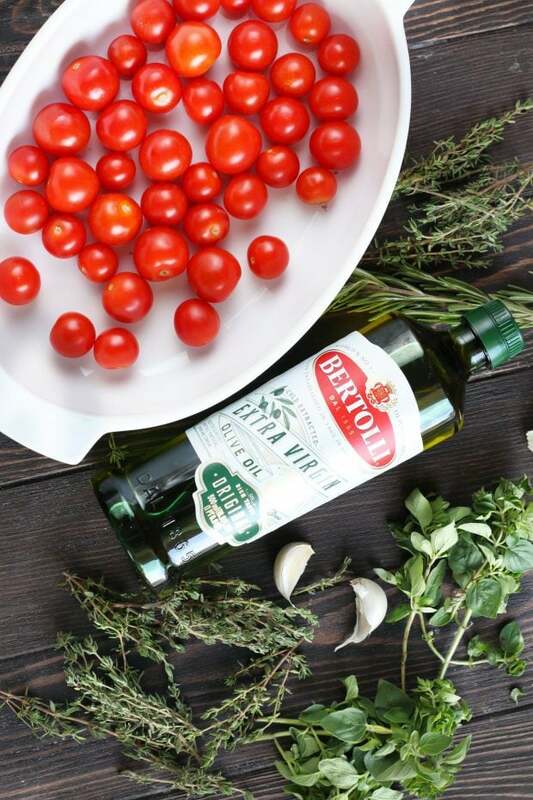 Featuring Bertolli Extra Virgin Olive Oil, the quick-cook method on these small tomatoes brings out an intense level of flavor that you will end up making every single week. This post has been sponsored by Bertolli Olive Oil. All thoughts and opinions are my own. Friends, this is one of the best discoveries I’ve ever made. I remember I tried tomato confit in a local restaurant just a month or two ago. It is such a simple concept, so I didn’t think I was going to flip out over like I did. 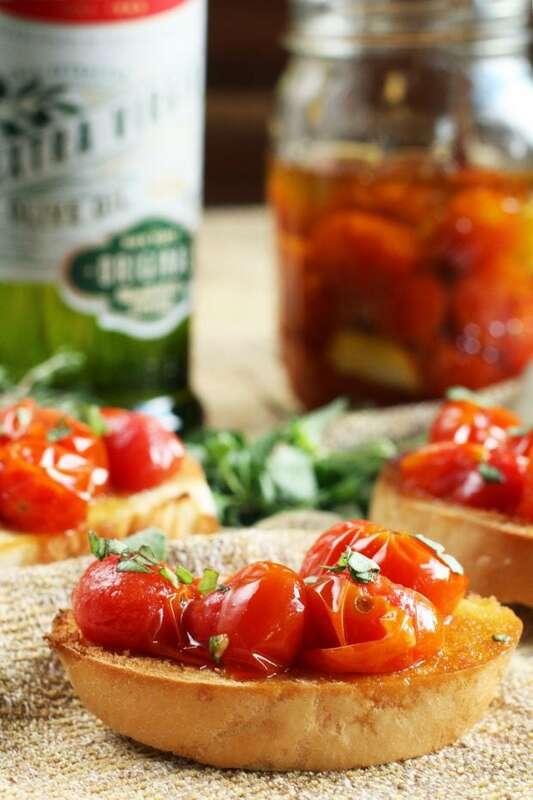 Essentially, tomato confit is cooking tomatoes slowly in extra virgin olive oil with some fresh herbs and cloves of garlic. The large tomatoes start to burst while remaining plump, helping them to retain all the richness of the oil and all the smooth, savory flavors of the other ingredients. When I added some of the tomatoes to a toasted piece of French bread, my eyes almost popped right out of my head. It was one of those first bites that you never forget. Of course, not all of us have the time to wait around for hours for large tomatoes to cook in extra virgin olive oil. 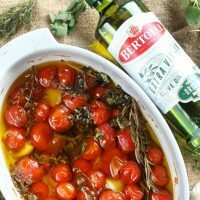 That’s exactly why I made this quick version featuring cherry tomatoes and smooth Bertolli Extra Virgin Olive Oil. 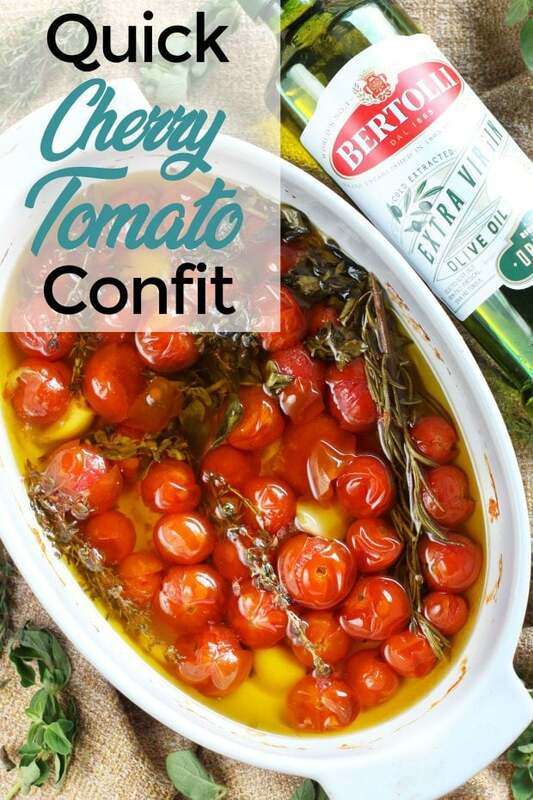 The cherry tomato confit is a recipe that comes together in just 30 minutes, and you can serve it up as an appetizer immediately thereafter or for the next few days. It also makes for a creative topping on grilled chicken, steak, or fish (especially salmon!). The key to the dish is ripe cherry tomatoes but more importantly, the extra virgin olive oil. Ever since I experienced olive oil tastings in Rome when I studied abroad there, I have learned to appreciate the importance of a high-quality extra virgin olive oil. That’s exactly why I continually reach for Bertolli Extra Virgin Olive Oil. 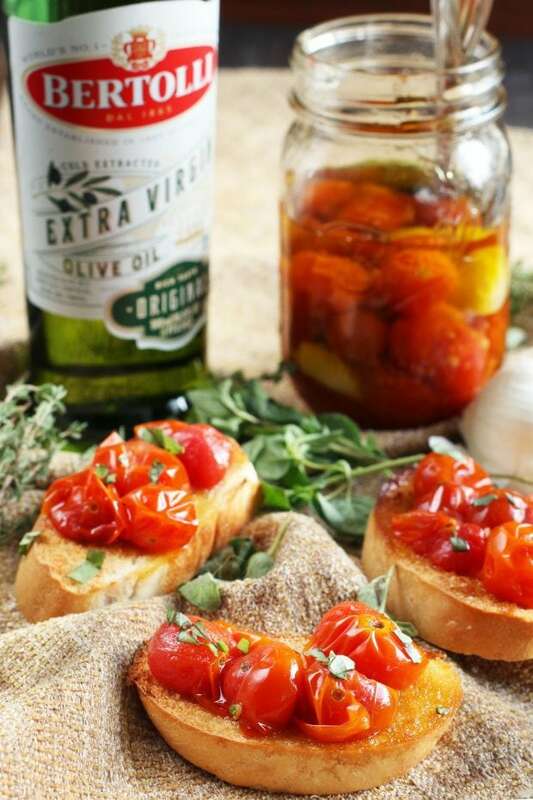 The “cold-pressed” method gives the olive oil a natural, full-bodied flavor that is slightly fruity on your palate. They may have come out with a new, gorgeous look for their bottles, but the same robust flavor is there. 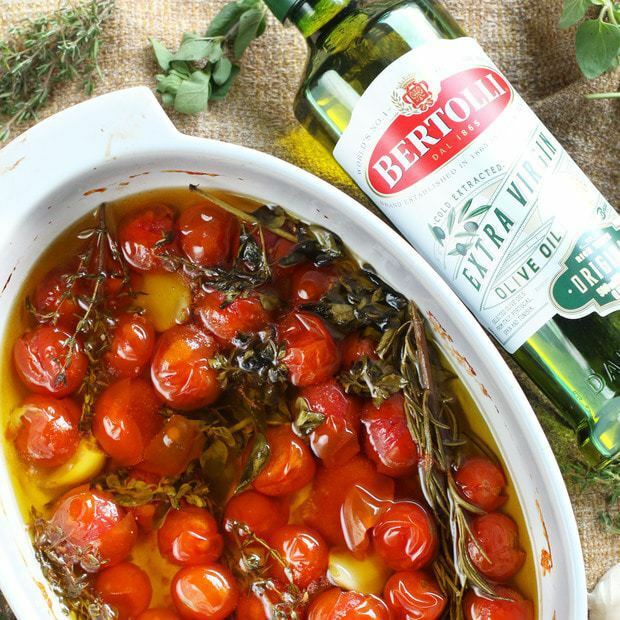 Their simple recipe is why Bertolli makes the world’s #1 olive oil brand, and you’ll be able to spot their spectacular new look on your local Kroger store shelves. I mean, they have 150 years of expertise, so you know you can expect greatness. 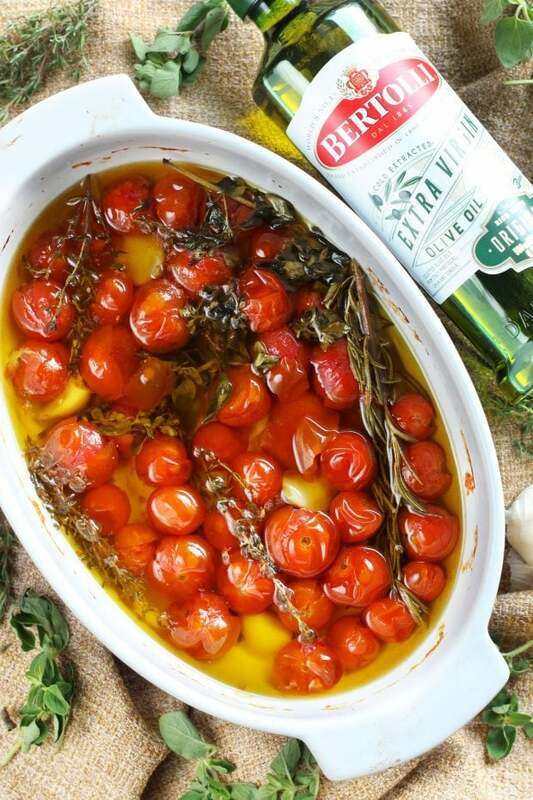 Once you make these tomatoes with this olive oil, you are going to be so thrilled with the flavor and texture, you will never want to eat tomatoes the same way again. So be sure to run over to pick up the new bottle at your closest Kroger store (that’s King Soopers for you Denver folks!). 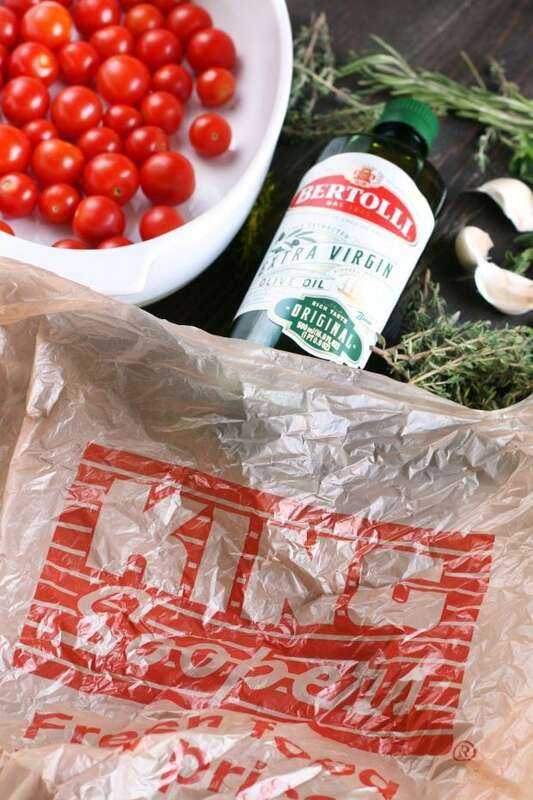 Click here to save now with $1 off any Bertolli item. 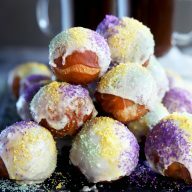 Need to know which Kroger store is closest to you? Be sure to click here to locate your local Kroger store. 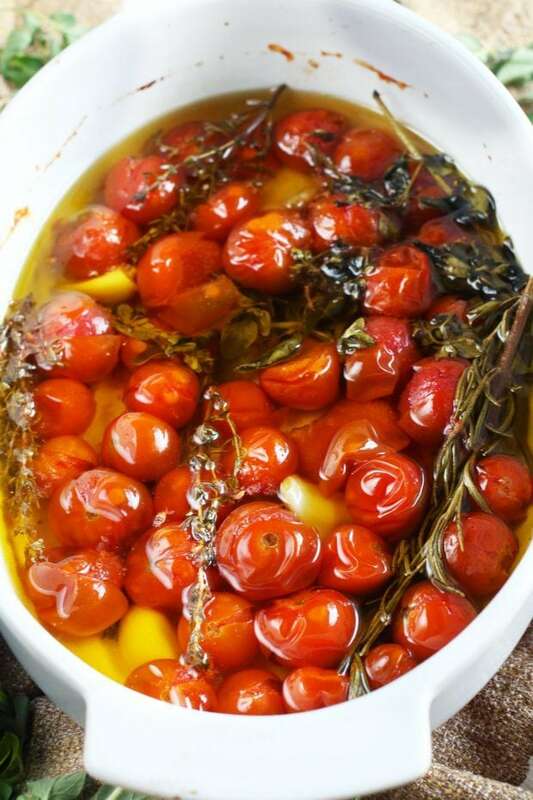 Pin this Quick Cherry Tomato Confit recipe for later! This is savory, delightfully creative recipe that can be used from topping toasted bread to serving with chicken or steak. 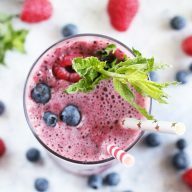 The quick cook method will change your life! 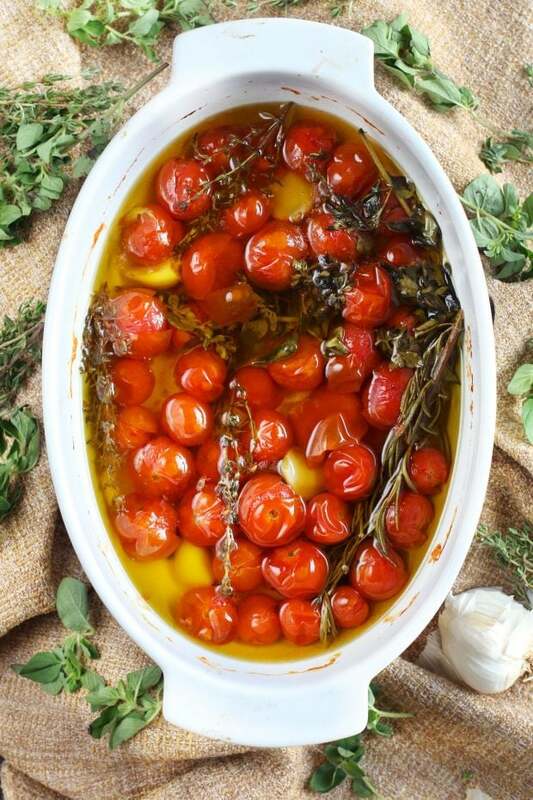 Arrange tomatoes in a single layer in a baking dish. 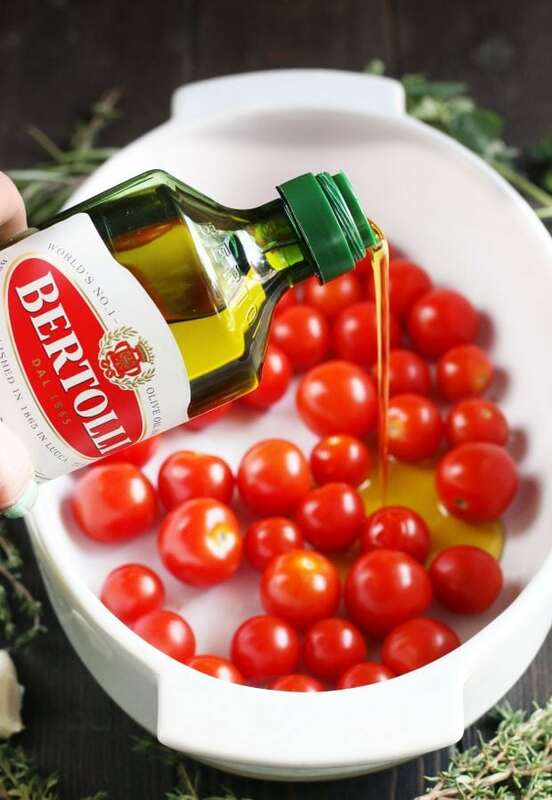 Pour the Bertolli Extra Virgin Olive Oil over the tomatoes. 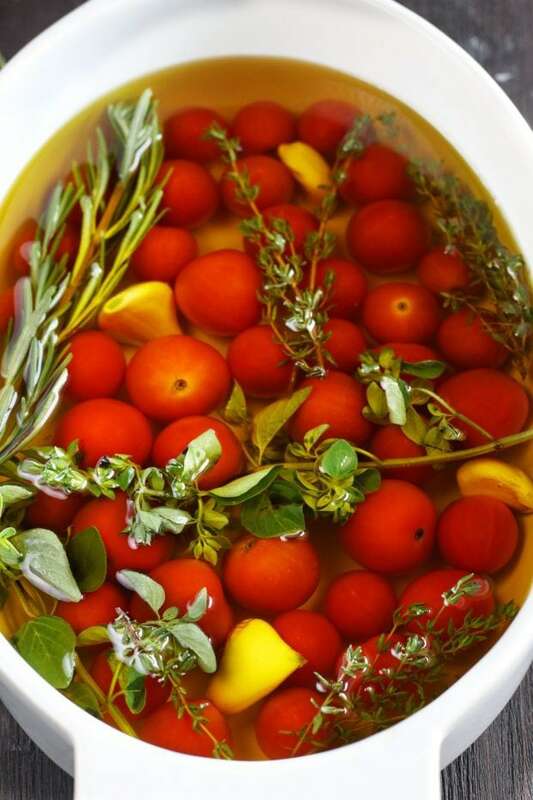 Add garlic cloves and sprigs of herbs around the tomatoes, submerging them in extra virgin olive oil. Bake until the tomatoes start to split but still remain plump, approximately 25 to 30 minutes. Set aside to cool to room temperature before storing the tomatoes with the olive oil and garlic cloves in an airtight container in the refrigerator.